Adele S. Benzaken is graduated in Medicine at the State University of Amazonas (UFAM)in 1978. Medical residency (1980) and specialization in Gynaecology (1985). Doctoral degree in Public Health at Oswaldo Cruz Foundation (CPqL&MD/Manaus). Director at the Tropical Dermatology and Venereology Alfredo da Matta Foundation in Manaus (Amazonas, Brazil) during 2007 until 2010. Member of the Panel from Experts in STI including HIV from World Health Organization, during December 2008 until July 2013. UNAIDS Country Coordinator in Brazil held at Brasília, from April 2012 until November 2013. 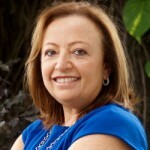 Dr. Benzaken is an Advisor at the Pan American Health Organization (PAHO) and also she is co-chair at the Committee for Validation of Elimination of Mother-to-Child Transmission of HIV and Congenital Syphilis for Latin America and Caribbean held by PAHO too. Adele S. Benzaken is currently the Deputy Director from the STI, Aids and Viral Hepatitis Department of Ministry of Health since December 2013. Mainly acting on assistance, prevention and manage of STI/Aids.